Guys, I am very excited about this cake. Because it makes me look like a better baker than I actually am -- doesn't it look like something that came from a store? Don't be scared. 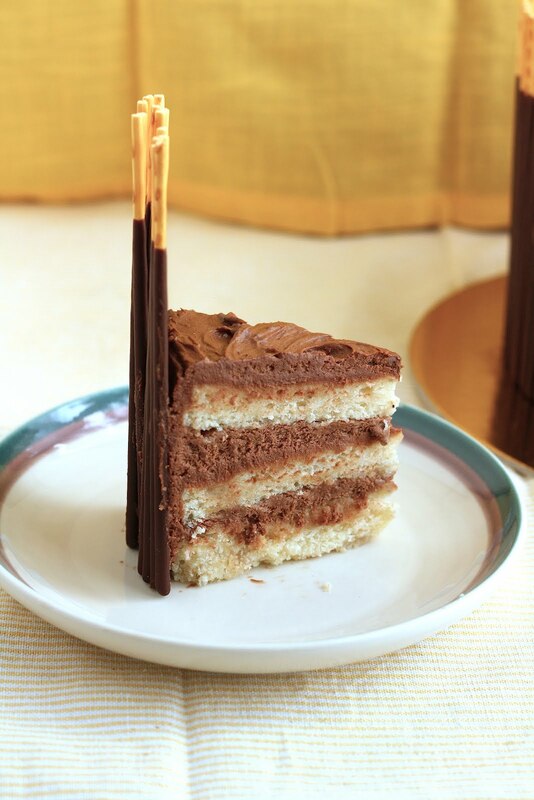 I promise you that this cake is so easy to make. All you need is a little bit of patience and many, many boxes of Pocky. It's a Japanese snack that basically consists of biscuit sticks coated in chocolate. You can often find them at Asian supermarkets, or even just the Asian/International section of your local supermarket. They are delicious on their own, but even better when lining cake to make an impressive, edible structure. 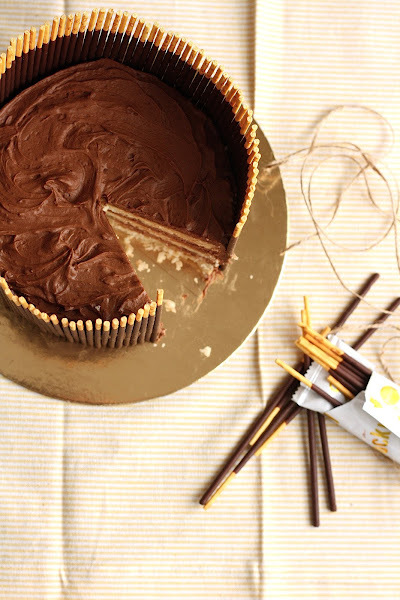 Because who doesn't love chocolate and banana as a combination? Now this recipe is actually a combination of recipes from a bunch of different sources. 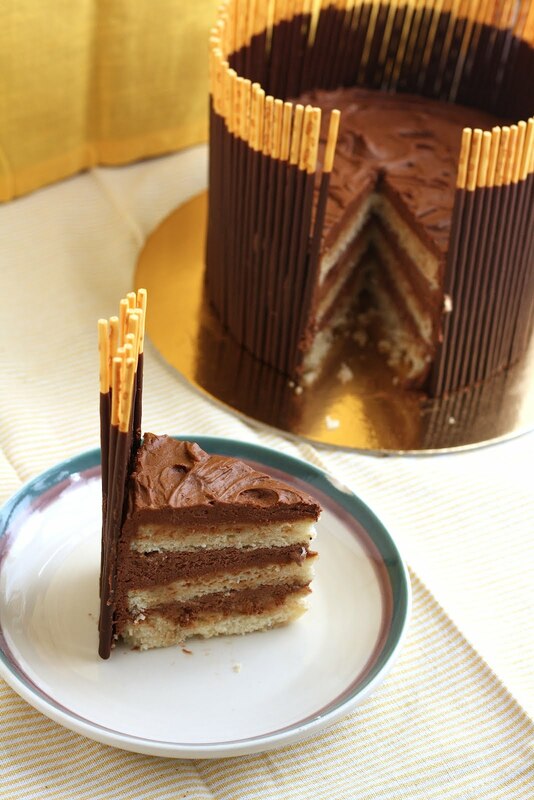 I got the idea of a Pocky cake after seeing Sprinkle Bakes's beautiful pink vanilla pocky cake, and was inspired to recreate my own version of the recipe. I decided to use a modified version of the banana cake recipe found in Momofuku Milk Bar's cookbook, editing out the weird and hard-to-find ingredients with no noticeable effects. Finally, since I'd been dying to try a recipe from Joy the Baker's cookbook, I decided to cover the entire thing with her recipe for malted chocolate buttercream frosting. Note how the cake even slices up easily if you place the knife in between pieces of Pocky. I feel like this recipe was a perfect combination of all my baking influences -- or at least, all the bakers I admire. 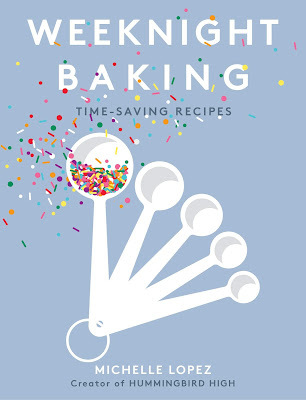 Sprinkle Bakes for the originality, beauty, and creativity. Joy the Baker for her completely delicious and yet totally accessible recipes. And finally, the Momofuku Milk Bar bakery, because we all know I have a total lady crush on Christina Tosi. I managed to find special edition boxes at my local Asian supermarket that sold boxes with 50 sticks each with 25 in 2 packets, but most Pocky biscuits come in packs of 6. If you end up with one of these smaller boxes, you'll probably need about 15 to 18 six-quantity packets. Combine 6 tablespoons butter and 1 cup sugar in the bowl of a stand mixer fitted with a paddle attachment and cream together on medium-high for 2 to 3 minutes. Scrape down the sides of the bowl, add 1 egg, and mix on medium-high again for 2 to 3 minutes. Scrape down the sides of the bowl once more. Stream in 1/2 cup buttermilk and 2 tablespoons grapeseed oil while the paddle swirls on low speed. Once the buttermilk and grapeseed oil has been added, increase the mixer to medium-high and paddle for 5 to 6 minutes until the mixture is practically white, completely homogenous, and twice the size of your original fluffy butter-and-sugar mixture. You're basically forcing too much liquid into an already fatty mixture that doesn't want to make room for it, so if it doesn't look right after 6 minutes, keep mixing. Stop the mixer and scrape down the sides of the bowl. On very low speed, add 2 bananas and mix for 45 to 60 seconds to ensure all the bananas are broken apart. Still on low speed, add 1 1/3 cups flour, 3/4 teaspoon baking powder, 1/2 teaspoon baking soda, and 1/2 teaspoon kosher salt. Mix for 45 to 60 seconds, or just until your batter comes together and any remnants of dry ingredients have been incorporated. DO NOT OVERMIX or your cake will be tough and I will be sad. Scrape down the sides of the bowl. Pam-spray te 3 cake pans and line with parchment. Using a rubber spatula, divide the batter into three equal portions and spread the cake batter in even layers across the three pans. Give the bottom of the cake pans a tap on the countertop to even out the layers and bake in the preheated oven for 25 to 30 minutes. At 25 minutes, gently poke the edge of the cake with your finger -- the cake should bounce back slightly and the center should no longer be jiggly. Leave the cake in the oven for an extra 3 to 5 minutes if the cake doesn't pass these tests. In a bowl of an electric stand mixer fitted with a paddle attachment, cream together 3/4 cup butter, 1/2 cup cocoa powder, and 1/2 salt. Mixture will be very thick, but cream for about 3 minutes on medium speed. Turn off the mixer, scrape down the sides of the bowl and add the 2 1/2 cups of powdered sugar. Turn the mixer on low to incorporate the sugar while adding 2 tablespoons milk and 1 teaspoon vanilla vanilla. As the sugar incorporates, gradually increase the mixer speed to medium-high. Stop the mixer and scape down the sides of the bowl as necessary. Beat until smooth. In a 1-cup measure, stir together 1/2 cup cream and 1/3 cup Ovaltine. Turn the mixer to medium, and pour the cream in a slow and steady stream until the frosting reaches your desired consistency: smooth, creamy, and spreadable. Add more powdered sugar to adjust consistency. Use a cake level to level out each layer of the cake. 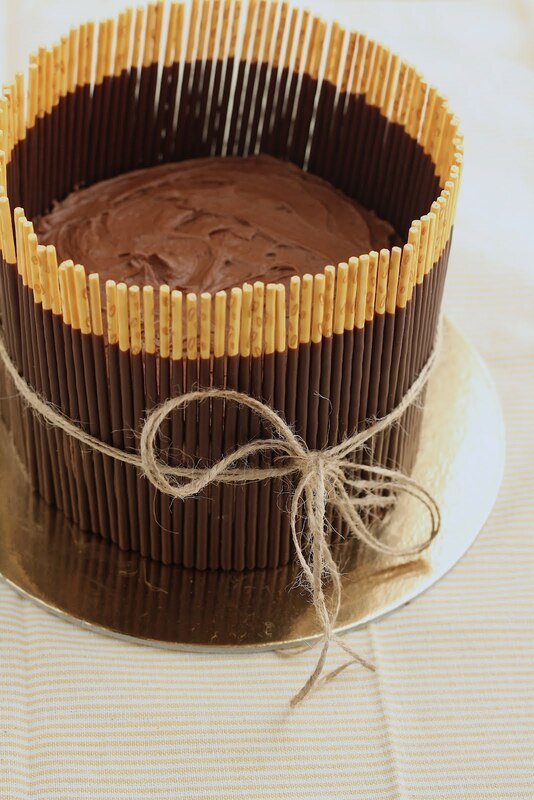 Choose the jankiest cake to use as your base, and spread a layer of chocolate buttercream frosting at the top of the cake. 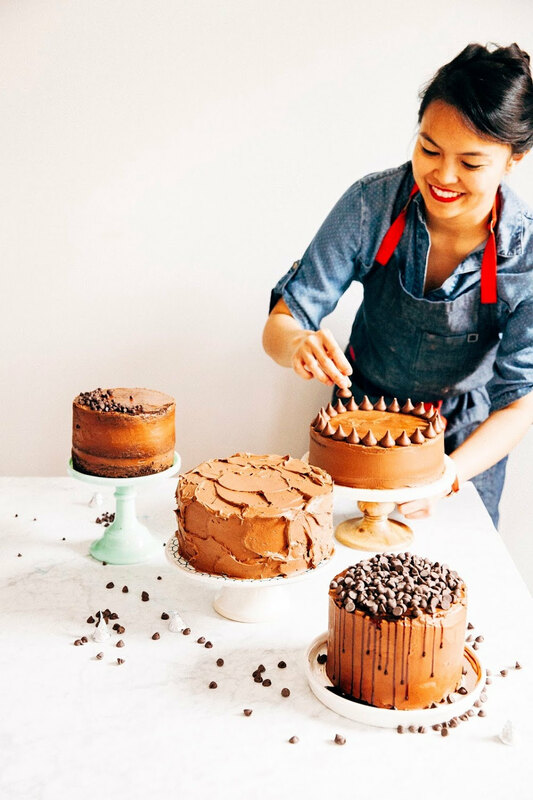 Gently lower the next cake on to of the first layer, and repeat the process until all layers have been stacked, but leave the top layer unfrosted. Next, create a crumb coat. This is a thin layer of icing that seals in loose crumbs. Simply spread the icing on the top layer of the cake, using an offset icing spatula. When the crumb coat layer is finished and evenly spread all over the cake, use a rubber spatula to spoon out the remaining frosting on top of the cake. Use an offset icing spatula to frost messy swirls -- Oh Happy Day has a great tutorial on frosting "perfectly messy" cakes. 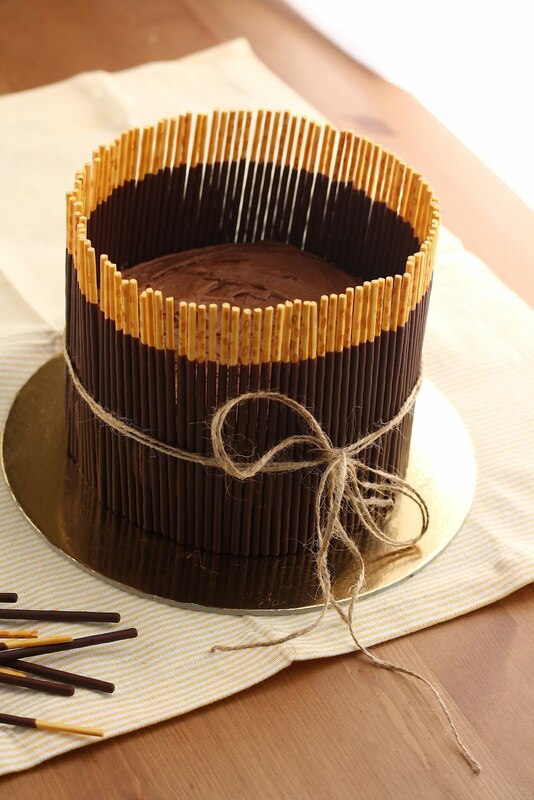 When you're done prettifying the top of your cake, press the chocolate pocky dipped-side down one by one into the sides of the cake until completely covered. Be careful not to press too hard into the cake, or frosting will ooze between the biscuits and make it look messy. When the cake is completely covered, put the cake in the fridge to chill for 30-40 minutes. 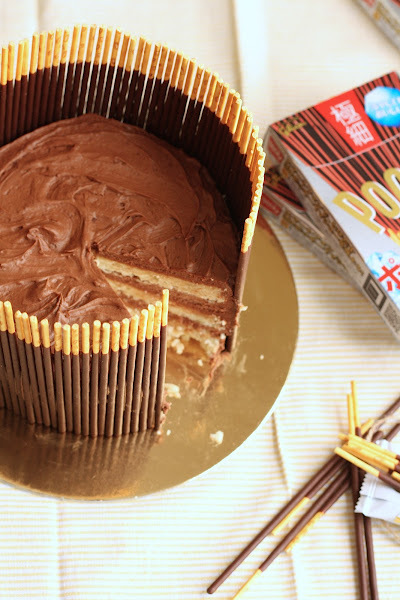 The finished cake slices easily if you place the knife in between pieces of Pocky. Enjoy!